A portion of the roof, that over the gazebo, is supported by gigantic posts. The posts we are using are 6"x6" by 20 foot pressure-treated posts. These posts are supported at the bottom by concrete piers and extend through the deck off the main floor, and support the roof over the deck. In the pictures you can see six pressure-treated ( the green coloured posts) posts: five 6x6 posts and one 8x8 post. The 8x8 post is required for a special purpose. 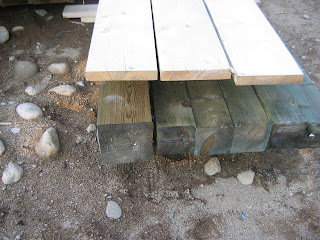 It is used for supporting another huge laminated beam - like that used inside the cottage to support the floor joists - except here it is used to support the deck joists. These posts are massive. It takes at least two of my strong strapping sons to move them! The task of righting them on to the concrete piers was a difficult one. A hole was drilled in one end of the post. This hole was a 3/4 hole which is just enough to allow the pin sticking out of the concrete pier to fit. The pin serves to keep the post in place. The end of the post with the pin hole was positioned so that as we raised the post the pin would enter the hole. Then comes the tough part... Three of us - through shear muscle power - raised the post, using various assisting tools like rope and 12-foot lengths of 2x4. Once raised into a vertical position we leveled and secured the post temporarily. Our main securing technique was to use 12- or 16-foot lengths of 2x4 to either attach the post to a nearby object like a previously secured post or the cottage itself. We would generally use two supports set at 90 degrees to temporarily secure the post. If we didn't have an object to secure it two then we would use two 2x4's set on either side of the post as about 45 degrees set in to the ground. Once the work of leveling and the post was temporarily secured, it was time for a break! 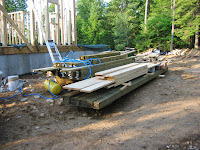 Permanent securing consisted of connecting the post to the adjacent post using a 2-ply 2x10 beam, and then, securing it to the ledger board on the Cottage using a 2x10 joist. In this way the post was completely tied into the deck substructure. This process was repeated for every post, securing post after post until the entire deck skeletal substructure was completed. Once the skeleton of the deck substructure was in place then we measured out and installed joists on a 16-inch center-on-center pattern. The whole process was repeated again at the very top of the posts for the posts that extended the full 20 feet. This set of beams formed the structure on which the roof would be secured. at the top by the beams forming the support for the gazebo roof. The remainder of the posts of the deck substructure only extended to the deck. Actually the posts extend three feet beyond the top of the deck so as to provide posts to which the railing will be attached.